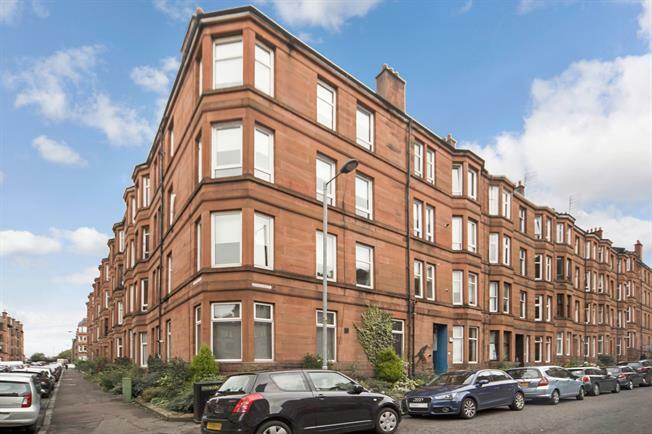 2 Bedroom Flat For Sale in Glasgow for Fixed Price £190,000. An outstanding traditional second floor flat enjoying commanding corner position. This stylish property has just been extensively upgraded by one of the West End's most acclaimed property developers, MLB Properties. The accommodation comprises security entry, hallway, truly stunning spacious living room with feature corner window which allows space for dining and incorporates a beautiful semi open plan luxury kitchen, two excellent double sized bedrooms and a fabulous luxury contemporary styled bathroom. In addition the property has gas central heating, stylish modern decor and new hardwood flooring within the principal apartments and quality contemporary carpeting within the bedrooms. Crow Road Retail Park is only a short distance from the property which includes a Marks & Spencer. Public transport links are all situated close by via bus, rail and underground at Partick's main transport hub and there is easy access to all areas of the West End.